Windows Vista Blue Screen (of Death)? I woke up this morning and found the following error on my Windows Vista 64-bit box. 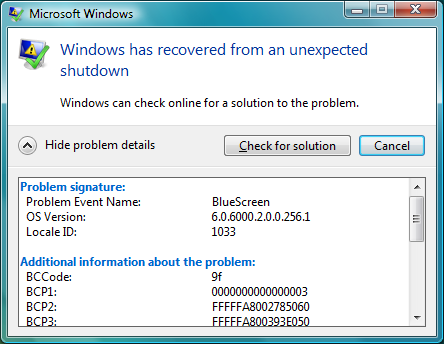 I am guessing the Blue Screen happened from some chipset drivers I installed last night. It is a testament to the great work the Microsoft development team has done with Windows Vista, that Windows is now able to recover, without a reboot, from the shoddy programming of 3rd party hardware driver developers. I am happy to see that Windows Vista isnâ€™t all glamor upgrades and I suspect this has to do with running most of the drivers in user land now.